So, what do the numbers mean? Well basically the numbers represent how many cubic inches 1 oz of down will occupy when the down is lofted. So, it is obvious that 900 cubic inches (900 down fill) is more than 550 cubic inches (550 down fill), so it now makes sense that the higher the down fill rating, the more space is occupied. This means that less of the higher grade down is needed to fill a space, so the overall weight is less with higher down fills. On another note, another general rule of thumb is to buy a bag 10 degrees lower than what you are expecting to need it for. (If you are expecting to use the bag in 20* weather, look at some 10* bags.) This will help to take into consideration the possibility of an overrated bag. But also try to know what kind of sleeper you are: Do you sleep cold? Do you sleep hot? 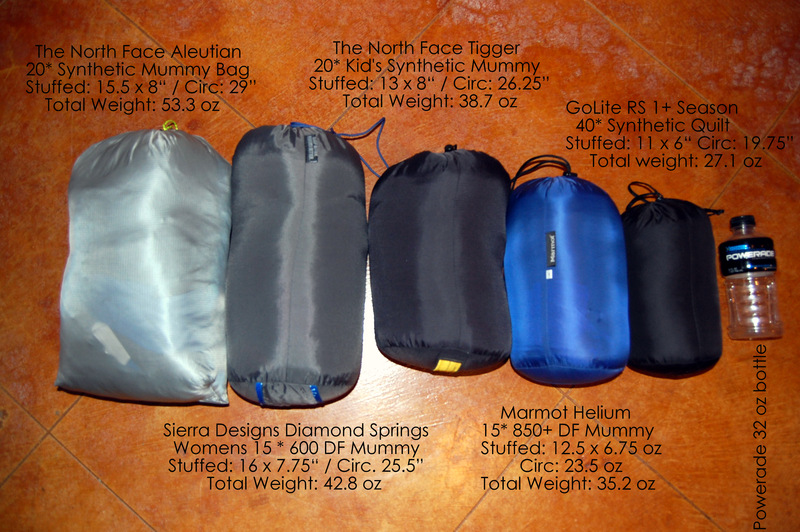 Just by knowing these things can also help you in making a wise choice in which sleeping bag to buy. And it is never a bad idea to test the bag at home, outside in the back yard or even on the porch one night before relying on the bag, especially in extreme situations, or even just for comfort purposes is never a bad idea. A liner is an option for some people. Liners are made of a few different materials and serve two main purposes. 1 Extra warmth, and 2. they help to keep your sleeping bag cleaner. I have read that some liners will add anywhere from 9 – 25 degrees of extra warmth to your sleep system (bag and pad). I have read that a simple thin silk liner can add up to around 10 extra degrees of warmth, while there are others of course thicker that really add-on the extra warmth. Of course this all comes down to you though. Just because it says so, don’t necessarily mean it. The only way o know for sure is to try it out for yourself. One thing to think about though is will you like a thin sheet inside your already snug mummy bag. Some people can’t stand it, while others love it. A good way to try it out is to get some cheap material and make a homemade liner to see how it feels for you. And then if you do like it the homemade liner may be all you need. Another good reason is to keep your sleeping bag clean. If you have a down sleeping bag (or even a synthetic one for this matter) you will not want to throw the bag in the wash every time you get back from a trip. A liner will help to keep the oils and dirt from your body from getting all up inside that high dollar material and clogging it up. Of course, another option for this is to always use a designated set of sleep clothes. But even going this course, the oils and dirt can still come from your arms and legs. So, these are just a few things on sleeping bags, quilts and liners. Again, do not take my word on any of these things. Go out and do the research for yourself. Things change every day and I don’t claim to know that much about any of it. I have had a very limited experience with all of this, and most of this information has been given to me second-hand or is my interpretations from the research I have done. I am only trying to help out by making things aware, so that you can dig a little too. Besides this is part of the fun. Good luck, and I hope that I have at least helped you to get started. We spoke about the marmot helium. I recently ordered one from bc.com. I like the bag but I tend to toss and turn allot…start to consider returning and trying a good 20 deg quilt like the enlightened rev x. Any experience with quilts. I tend to get alittle tangled upon the bags as I tend to mostly sleet on stomach. I have a few quilts and I love them, although, I don’t have a cold weather quilt yet (maybe next year). I have taken my 35 F Enlightened Equipment Prodigy quilt down to 25 F with my down pants and parka though. Personally, I love quilts in all the conditions I have used them so far. At this point though, it is hard to say if I will like one or not for temps below about 15 F. Given my experience with them, I think I will, but I can’t say for sure at this point. I would not suggest getting rid of your bag until you have at least tried out a quilt though. And one way to at least get an idea would be to simply unzip the Helium and drape it over you as a quilt rather than zipping it up over you as a bag. This will be a bit bigger than most quilts, but in cold temps, I would want a wide quilt, which is 56″ wide from EE. For reference, the Helium is 62″ when opened up.